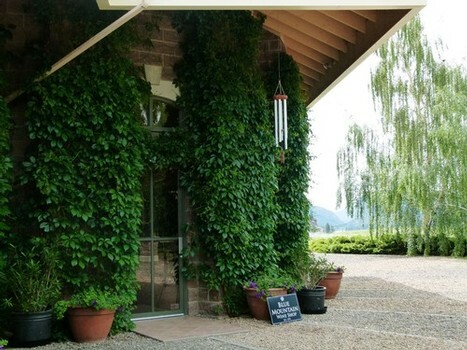 May marks the start of another exciting tasting room season at Blue Mountain Vineyard and Cellars. We are now open seven days a week, daily from 11am - 5pm. If you haven't visited the winery yet, this is the year to come see us. We highly recommend packing a picnic lunch and spending a little time taking in the stunning scenery at the winery. Surrounded by vineyards and well off the beaten track, bask in the view of McIntyre Bluff and enjoy the sunshine Blue Mountain is well known for. If you can't plan lunch, our neighbours down the road at Liquidity Bistro will be happy to feed you. Across the way there are a couple of other great spots to grab a bite. Wild Goose Vineyards last year opened the Smoke N Oak Bistro where you can enjoy southern BBQ. On the other side of the valley, enjoy the stellar views from See Ya Later Ranch looking north up Skaha Lake. Their outdoor patio is a great place to while away an afternoon. With no shortage of great places to eat and excellent wineries to visit your trip to Okanagan Falls is a destination in itself. Make a day of it, call your friends and come see us. It all started with tasting it, enjoying it at wine festivals and simply having a good time. I wanted to know more about the beverage which is not only a great pairing to food but also an awesome companion for good times with friends and family. I definitely need to see a lot more wine regions to answer this question appropriately. However, so far I enjoyed the D.O. Penedès in Spain. I enjoy Cava - the fresh uncomplicated Spanish sparkling wine and I like the pride of the local people for Cava. Besides this I loved the atmosphere of a little community called Aniane close to Montpellier in the wine region Languedoc Roussillon in the south of France. There are lots of wine regions in the world to discover and I am just about to experience another amazing one in British Columbia's Okanagan Valley! Red or white? ;) I am generally passionate about wine and I love it’s diversity. “Anything but Chardonnay. No matter if it’s oaked or unoaked” was what I used to answer. However, I experienced it is not only the variety but also the winemaker and his philosophy what can make the difference. I am a big fan of Pinot Noir. It is not easy to cultivate, takes a lot of attention and comes with a nice fruit and acidity. It is also very versatile - as a single varietal wine or in a blend for example in Champagne, Pinot Noir always takes a big part. It is an elegant variety which is not bold but comes with a strong personality. However, I also like full bodied varieties like Cabernet Sauvignon or crisp white varieties like Riesling and Sauvignon Blanc with a bit more acidity and minerality. And then there is Pinot Gris. Smoother, creamy and nice peach flavors. Red, white, rosé and sparkling wine ;) It would probably be the wine I enjoy drinking without even thinking about the wine itself because the company I am having it with is that great. HonestIy I can’t think of my favorite wine from any particular wine maker or region. I enjoy whites which are gently matured in French Barriques or white wines with a nice crisp taste. I love Tempranillo from the Rioja, Chianti and other full bodied reds for example from Chile or the South of France. I think it also depends on the season, the mood and the occasion. I discovered that taste is actually an ongoing process which is constantly changing almost like evolution. However, that’s what I love about wine…its so versatile and there is always something new to discover. What you like best about being in the Okanagan? Besides the beautiful drive next to the lake and vineyards every morning on my way to work it would be: new impressions and experiences in a different culture. It’s a great privilege to live and work at a place where people go for holidays because it is that awesome. I really appreciate being here and the best: It feels like holidays. What you miss most from home besides your family? What do you hope to learn from your experience at Blue Mountain Winery? To clear up some clichés about Canadian (BC) wines when I am back home. Canada is mostly pictured with hockey, the Rockies, and forests but not with wine and if it was wine then its ice wine. Discovering a new wine region and specially one that is not very famous in Germany and Europe is a great opportunity. I hope to learn more about different and innovative marketing tools and activities being used and to experience Canadian customer needs. What do you hope to be doing 5 years from now? Still enjoying the wine business as much as the first day I decided to get into it. To provide people with sparkling wines they enjoy. Winemaker anywhere in the world that you most admire and why? My brother. For the passion and ideas he puts into producing our own sparkling wine. 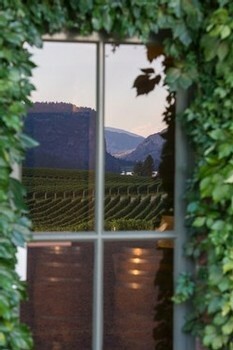 The tasting room at Blue Mountain is a place that from a visitor’s perspective possesses a sort of mystical quality. With its high ceilings, and windows looking out to the infamous view over Vaseux Lake and McIntyre Bluff, it feels totally removed from my normal reality. In short, it's a beautiful place to come and taste some nice wines, but it is also a beehive of activity — most of which happens oblivious to people like me who normally spend their time in front of the tasting bar, gazing out the windows, and sipping my way into an ethereal wine high. Recently I awoke from that wine daydream when an invitation was extended by Christie to come work a shift in the Blue Mountain tasting room to see what really goes on in a typical Saturday. As a more-or-less behind the scenes marketing and social media consultant for the winery, my inner wine geek jumped at the chance to get my hands dirty so to speak. Right from the get go I had to question my own sanity for accepting this temporary role! I am exaggerating of course, but from my first step onto the tasting room floor everything was more complicated and busy than I could ever have expected. The first visitors in for the day were tasting with a fairly intense looking notebook filled with detailed observations about each wine, and their questions were nothing short of expert. It was only 11am and I was already well out of my depth. Julie, who is a regular host in the tasting room, acted as my mentor for the day and upon seeing the look of bewilderment on my face, smartly sent me to the back room to deal with dishwasher and glass polishing duties. While I've loaded and unloaded many a dishwasher in my day, it became apparent that I was not actually that great at this. The sheer number of tasting glasses that get used in a day creates a constant need for glasses to be cleaned and polished. While I was thorough, I noticed that I worked about half the speed of Julie. When it came time to carry the glasses I could carry maybe four or five at best, Julie can carry twice this amount — my technique is clearly lacking. After several rounds of dishwasher duty, I find myself back in the tasting room where I am running boxes of wine from the warehouse to the front as the supply levels dwindle in front. Also, with the number of white wines that Blue Mountain tastes it's always important to have the supply fridge stocked with the next few rounds of Sparkling Brut, Pinot Blanc, etc., so that the visitors can enjoy their wine tastings at the correct temperature. I'm breaking a sweat, but this is apparently normal. Finally, just after lunch, the tasting room erupts into pandemonium…at least for me. While I'm still sweating, Julie is looking quite calm dealing with the four groups of five or so that have just shown up. I see a chance to make myself useful, and bring glasses to the waiting folk and start pouring some wines in the small groups that have formed while waiting. By this point I have become fully aware that about all I can do competently is be a good host, tell some bad jokes, and keep people happy, which in some sense is what wine is really all about — fun times, good people, and good conversation — simple moments. Still, I’m looking over at Julie for approval as I’m starting to realize that things are a bit different on this side of the bar. Around mid afternoon I finally start to hit my stride, and this whole tasting room adventure is becoming less stressful and much more fun. The sheer variety of people that come into the tasting room is fascinating, and there are literally people from all over the world that come to visit. Older folk, younger folk, wine connoisseurs, and newbies, that all share a common interest in wine. Everything is going swimmingly until the barrage of technical questions begin in my sidebar tasting group. First a question about battonage, then carbonic maceration, then electric fencing in the vineyard, then Methode Traditionnelle champagne making, then about French Oak and forests in the nether regions of France, then about vineyard microclimate, then about corks vs. screw caps, then about…well, you get the idea. Thankfully by this point Blue Mountain's winemaker Matt Mavety has stepped into the tasting room and is able to answer all of these inquiries in great depth. By the end of the day my feet are tired, I’ve talked to a couple hundred people, and I’m starting to wonder where I left my half-eaten sandwich. Perhaps Nikita or Chablis the vineyard dogs ate it while I wasn't looking. Over the course of the day I had memorized most of the information available on the back of the bottle, and also picked up a lot of interesting knowledge from Matt & Julie. Most importantly though, it was a fun day for both me and hopefully for the people I had the opportunity to chat with. While it was a completely humbling experience, I come away from this with a great appreciation for how much there is to know about wine, and the level to which many wine drinkers really want to learn about the craft of winemaking. Next time I'm in for a tasting I will have an understanding of just how hectic things can be in these summer months, and will appreciate the knowledge of those behind the bar much more. Who knows, I may even moonlight on the other side of the tasting room again again if the good folk at Blue Mountain will let me. The stories and happy visitors made for a hectically satisfying day! Chris Stenberg is a guest contributor to the Blue Mountain Winery blog. 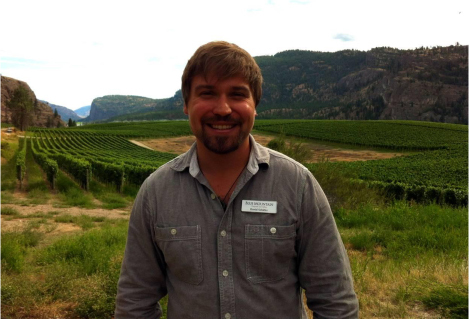 By day he is a media producer and online marketing consultant to the winery, and has spent a good deal of time around the wine industry in the Okanagan, but still considers himself a humble student, learning as much as he can one glass at a time.